So I might be on a bit of a cookie bender but I figure these carrot oatmeal coconut cookies are healthy enough that they barely classify as dessert. Right? Ya, that’s what I thought. So, it’s all good…bring on the cookies. Let’s see what these little healthy treats are all about, aside from being totally delicious and a little addictive. Sounds great, right? They totally are! Now for some bad news, I might have to take a little break from sharing treat recipes on the blog. I’m chipping away day by day at my nutrition challenge and let’s just say my willpower is being put the the test. I’m struggling with a. eating all the batter as I bake (someone has to taste test, right?) and b. limiting myself to one cookie after they’re done (…someone has to taste test, RIGHT??). If I don’t have treats in the house, I have no problem but at this very moment I have a fridge full of cookies, muffins and almond joy bars. Like I said, I better take a little break! I might have a bit of a sweet tooth. 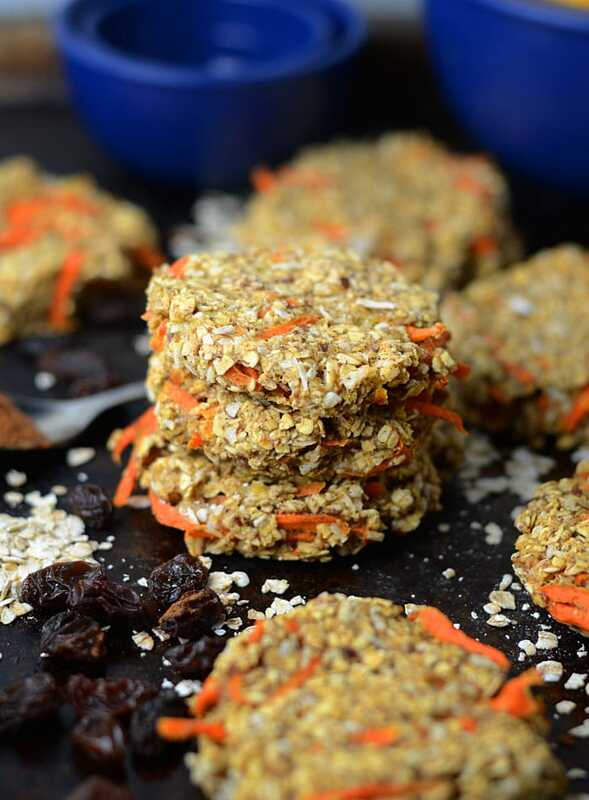 I still stick to healthier treat options like carrot oatmeal coconut cookies, but sugar is sugar and I love sweets! If you guys haven’t purchased one already, I’d really recommend picking up a digital food scale to sue in the kitchen. Volume measurements can vary greatly so it’s much more accurate to go by weight. You can purchase one here on Amazon for less than $20. If you make this recipe and enjoy it or make any substitutions that might be helpful to other readers, I’d greatly appreciate you coming back and leaving a comment to let me know! Even better, snap and pic and tag me on Instagram @runningonrealfood. It seriously makes my day when that happens! 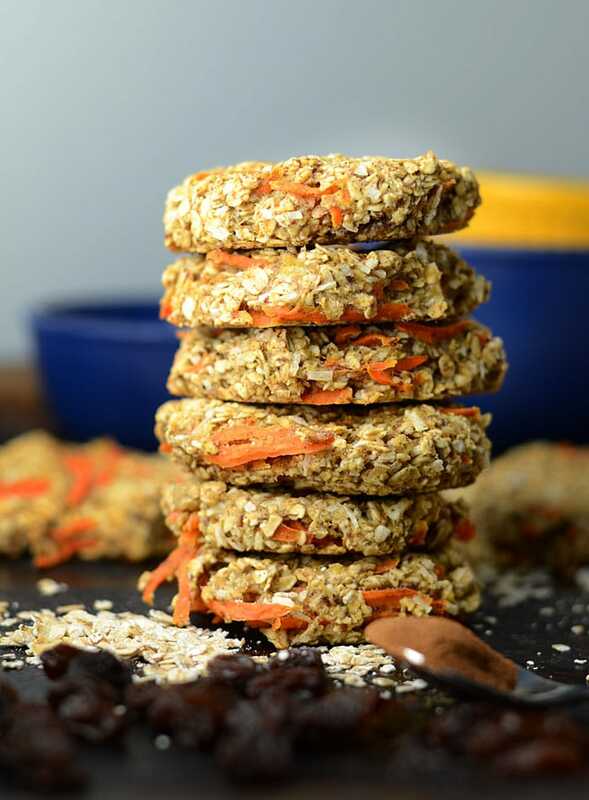 These healthy carrot oatmeal coconut cookies are easy to make with simple, wholesome ingredients. 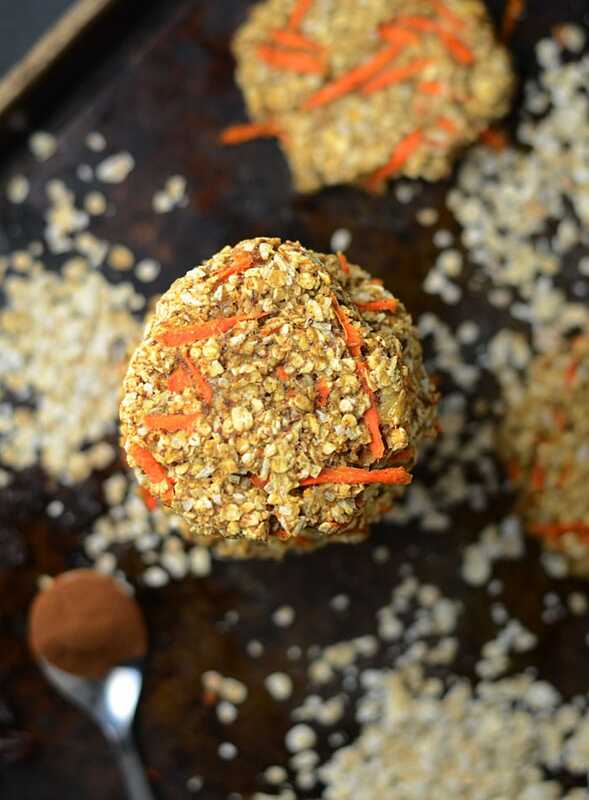 They’re oil and gluten-free, with no refined sugar, they have a soft and chewy texture and can be enjoyed as a snack, for breakfast on the go or a healthy dessert option. 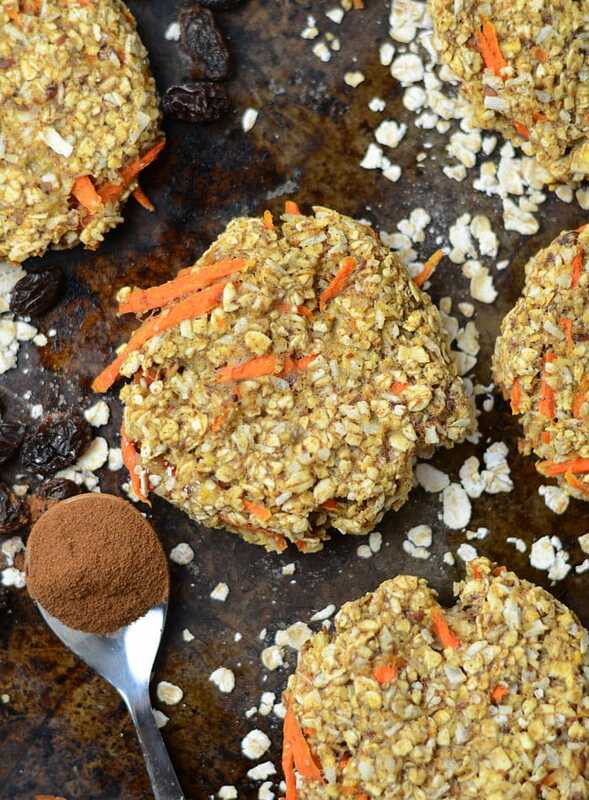 Mix your flax egg and set aside. Place the 3/4 cup of quick oats in a food processor or blender and grind into oat flour. Add the ground oats and the rest of the dry ingredients to a bowl and stir to combine. Add in the flax egg, mashed banana, applesauce and grated carrot and mix well. Roll into 10 balls and place on a baking tray. Press the ball down to form cookie shapes. These can be stored at room temperature or in the fridge. 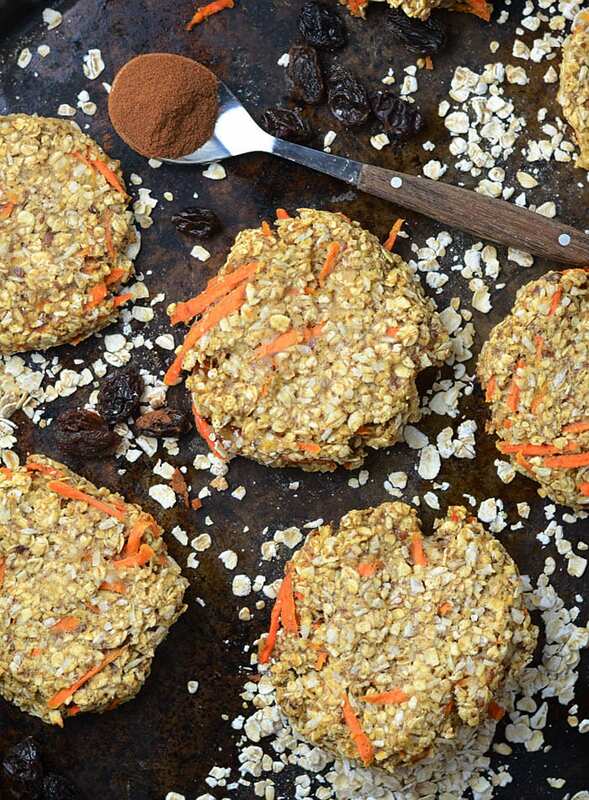 Awesome looking oatmeal cookies! I haven’t had one of these in years and would love to try it! Hi! Yes, measure the ground oats before you grind them. I think extra banana should be fine to replace the applesauce 🙂 enjoy! Vegan diet is the best..
Hi ! I’m a vegan from France and I made your cookies yesterday. We all liked to eat them with a glass of plant milk or simply by themselves ! Best carrot cookie ever and so satiating + satisfying after just one. I added in raisins and chocolate chips, So Good! Awesome, April!! I want them with chocolate chips now..haha. Sounds so good! Glad you liked them.